You are not in this relationship with Jesus by accident, he chose you (15:16), not everyone he chooses come into relationship, many ignore his call but you were chosen and appointed to bear fruit. He didn't choose you to do his bidding, to keep religious rules or to restrict your life. You are not a servant, Jesus calls you friend (15:15). He does call you, as a friend, to have a servant attitude though. Jesus first sets the example of a servant attitude and asks that you do as he has done (13:15). The example Jesus sets is washing his disciples feet, You don't need to take this literally, although there is a lot of humility in doing so. Once I became a Christian I found I could no longer function in my 'bottom line', money driven career and still grow in Christ, so I quit with no idea of what I was going to do. God certainly knew, from suits, meetings and money I became a carer and I washed feet most days. Many were not nice feet and yet the act was so loving and kind to an elderly person who can no longer reach them, that the reward was worth more than any amount of money. Yes it was a job and I got paid (although it is a seriously underpaid vocation), but that job taught me so much about the heart of Jesus. I learnt what it meant to do for others as he had done for me. Through the act of washing his disciples feet he was showing the full extent of his love in a practical way to teach them. The thought of washing feet, helping a stranger, giving time to someone you dislike etc.. can make you feel as if you are lowering yourself, that you're better than that or that you just don't have time. Jesus however, knew where he came from and who he was in God (13:3). No act, not even death, could strip him of his confidence in who he was and nothing could change his status as the Son of God. When you are secure in your relationship with Jesus then nothing can lessen who you. Why shouldn't you be secure? You are loved by Jesus in the same way Jesus is loved by God (15:9). You remain in that love by following him and keeping his commands. 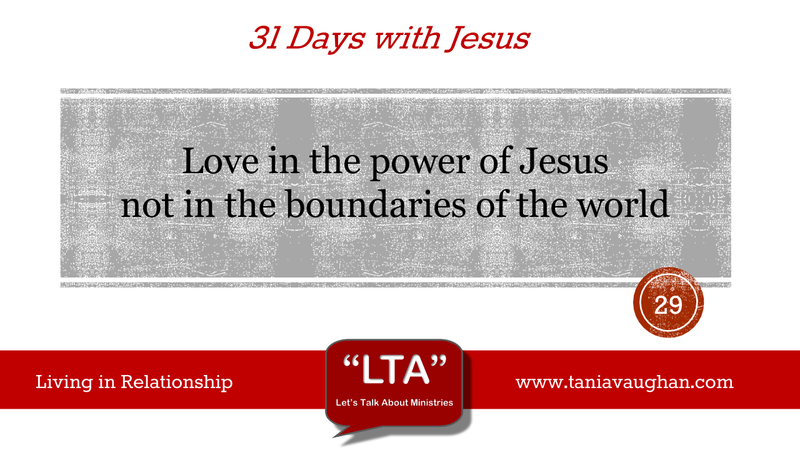 It is that love, from the security of your relationship with Jesus, you share with others. Jesus says love one another, not as the world loves, but in the same way he loves you (13:34, 15:12). This is not a new command it is Jesus' reflection of God who even way back in Leviticus speaks against revenge and grudges and commands that we love our neighbour. In your relationship with Jesus you know you have been chosen and you know you are loved with the same power as God loves his Son. How are you showing that love to others? Lord, thank you that you love me so much you wash my feet and you died for me to show that love. Lord, if I could love with even a degree of that depth I could change the world. Help me to not just receive your love but to example it and love others as much as you love me. I don't want to love within the boundaries of the world but in the security of knowing who I am in you. Do you remember games at school or playing football in the playground? You'd all line up and the 'Captains', usually the best two players or the most popular two kids would go out front and, in turn, start picking their team mates. One by one I would see the row get shorter and shorter as they would go and stand with their respective team until there was just me and the odd kid - yes maybe i was an odd kid too! Sometimes the captain with the strongest team would even let the other team have both of us such would be the handicap!! You see I was not particularly good at sport; I wasn't tall, fast or athletic, had no real skill at football - I wasn't popular, handsome or bright or even particularly coordinated. Being picked last is, and always will be unpleasant! Being chosen by Christ therefore is huge for me! the thought that I was hand picked to be his disciple is amazing. You see JC knows my potential, my skills and knows that only I will do. Yes, Jesus calls us all however He knows and loves each one of us individually and does not love any one of us more or less than the next. And all we need to do is to accept Him - it is not easy nor is the journey going to be a bed of roses. JC himself states several times throughout the Gospels that many will be persecuted in his name. But when you consider the price Jesus paid for our sin - its not that much to ask - is it?